Pet Bio Cell to the rescue! Pet Bio Cell to the rescue!!! Watch and Read all these amazing stories. If you like what you see, you can get your Pet Bio Cell here! Sampson – running and playing now….Look at me now! Our dog was diagnosed with stifle disease , we started him on biocell pet and in less than 2 months he’s out walking with no limping ….I wish I had taken pics of him trying to get up and his walking…. 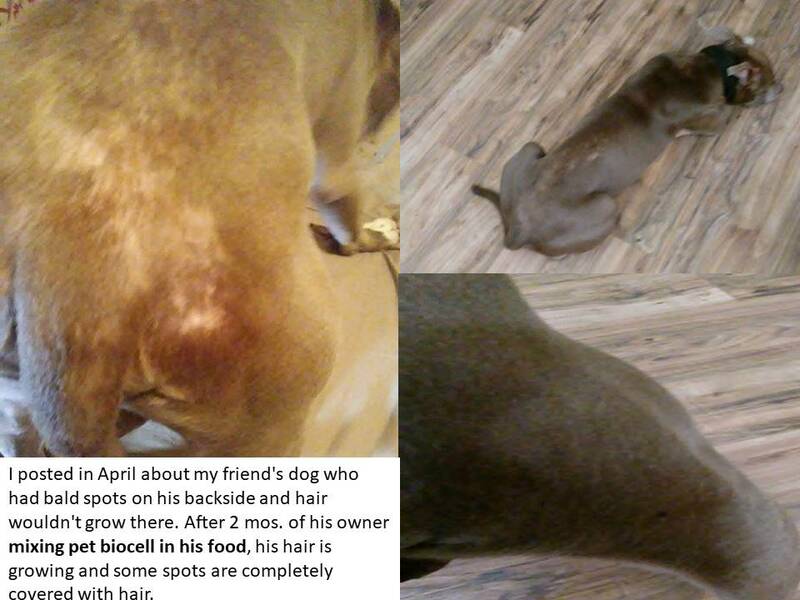 he’s only 3 and this product is going to give him a life back….thank you biocell – Look at me now! This is Lance. He was adopted as a hospice. He was given 2 weeks or so.. he had to be carried out side to potty as he had loss the use of his back legs. We started him on an aggressive dose of Pet bio-cell… this is a little over a month. I now say, lets give him 2 more years!!! !.Not to mention… NO MORE TUFFS OF HAIR FALLING OUT..I have to update this post… Look at me now! Maybs had her ACL surgery 2 weeks ago Monday. She started taking liquid Pet Biocell last Saturday 5 days after her surgery. Within 4 days on Tuesday she was running for the door & nearly a week later on Monday was walking outside without a limp!! She had a 14 day turnaround from surgery to walking limp free on her own so i am thrilled she healed up so quickly after I introduced her owner to this incredible product which was perfect for helping her heal quickly!! Watch me run!!!! Just when you have given up and THINK your fur baby can’t recover, try Liquid Collagen Pet Bio Cell. Imagine no more limping, sliding, aching, scratching, etc. . Try Pet Bio Cell for 90 days…He is walking on his own!!! Look Mom, I’m running and here is why – Thank you for my Pet Bio Cell!! This is how we take it – yum! PS: I put in their food, I don’t want to contaminate the bottle..I started #Sampson, my 9 year old Boxer on our pet Liquid Biocell earlier this summer. 🐶 Sampson had ACL surgery when he was only 3 and although he recovered nearly 💯 he had been slowing down with age and had started suffering with arthritis. 😭 This happened in 1 week while taking liquid collagen and look 👀 at the difference! He is running and playing and keeping up my 3 year old Boxer. 😮 And.. I wish you could pet him and feel his coat; soooo soft and shiny. 🤩 As an animal 🐶🐴🐎 lover, I am so excited to find a product that is able to help so many pets improve their quality of life. This product is such a great fit in my lifestyle as I take it, Sampson takes it, and my show horse Chewy takes it too! Before Pet BioCell – and After Pet Bio Cell, look mom I am running again! Sampson today! I am walking on my own!!!! Thank you Pet BioCell. 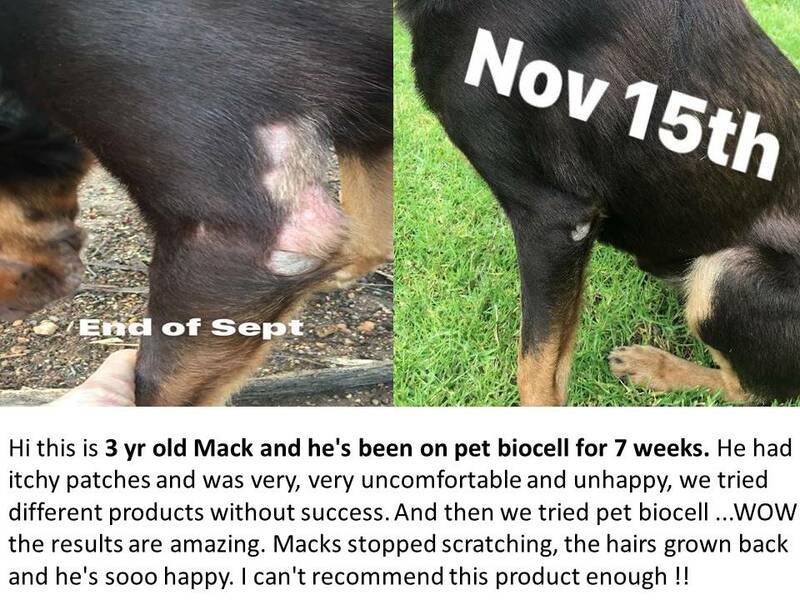 More great stories…Hi this is 3 yr old Mack and he’s been on pet biocell for 7 weeks. He had itchypatches and was very very uncomfortable and unhappy, we tried different products without success. And then we tried pet biocell …WOW the results are amazing. Macks stopped scratching, the hairs grown back and he’s sooo happy. I can’t recommend this product enough ! !